First I want to thank Book World for giving me a copy of this book to review!! Portland, Oregon, is the perfect fit for someone like Meg Reed. It’s a city with a small town feel, where she can crash on the couch of her best friend Jill, now that she’s graduated from journalism school. . . But a girl needs a job, so Meg bluffs her way into writing for Northwest Extreme magazine, passing herself off to editor-in-chief Greg Dixon as an outdoor adventure enthusiast. Never mind that Meg’s idea of sport is climbing onto the couch without spilling her latte. 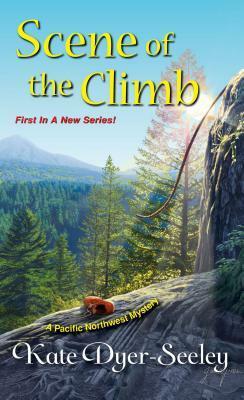 So when she finds herself clawing to the top of Angel’s Rest–a two-thousand-foot peak–to cover the latest challenge in a reality TV adventure show, she can’t imagine feeling more terrified. Until she witnesses a body plummet off the side of the cliff. Now Meg has a murder to investigate. And if the climbing doesn’t kill her, a murderer just might. . .
Meg Reed is a fantastic new heroine on the cozy scene. She embellished her “adventure lifestyle” just a bit to land the job but in the day and age you do what you have to do to get hired. Like Meg my sense of adventure is from a watching standpoint but she sure did give it the old college try. Her father was an investigative reporter and like him she keeps digging until she get answers and in this case she needs to find out why one of the reality show contestants took a dive off the top of Angel’s Rest. She is certain it was not an accident. The author has created a great cast of supporting characters as well. Meg is camped out on her friend Jill’s couch until she can afford a place of her own. Her friend Matt is a great friend but there is a little romantic tension there. Her boss Greg seems to a great guy but he could also be a suspect, no spoilers here. Meg is always so nervous around him and their interactions add a bit of humor. Like me, Meg tends to spill things and is a bit of a klutz, especially around her new boss. The setting for the story is a character in itself. Kate Dyer-Seeley is very descriptive in her writing making it very easy to see what the characters see. The beautiful skylines, the rocks, the cliffs, and the trails through the woods. Oregon has some very beautiful places for adventure enthusiasts and she sure does them justice in this story. The mystery plot is also really good. It has the expected twists but there is one in the woods that had me on the edge of my seat and when the details were revealed all the hair stood up on my arms. Find out more about Kate Dyer Seeley on her webpage here. I am giving my review copy from Book World away!! Sounds like another interesting series. Thanks. What a great idea for a new angle in the cozy genre! Thanks for the intro! Thanks for the opportunity to win. This book sounds just different enough to really grab me. I love the outside setting, hiking vibe. I would like to read it. That sounds like a fun series and an original premise! I have heard so much about this book and it sounds fantastic, would love to win!